Pecan Legacy Park in Chesterfield, Missouri is a half-acre park designed to preserve and protect the 124-year-old pecan tree located on the property. My heroic scale, bronze, PIONEER FARMER is a tribute to the Bayer and Brasher families who owned and farmed this land. Chesterfield mayor Bob Nation and Chesterfield Blue Valley Developer, Dean Wolfe unveiled and dedicated the artwork on October 27, 2016. 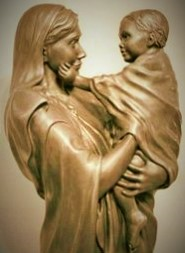 In the fall of 2019, my new sculpture of St. Joseph will join my 2002 sculpture of the Madonna and Child at Incarnate Word Church in Chesterfield, Missouri.